Worried about hackers bringing down your site, or spreading malware to your visitors? Then you need a security plugin to keep your site safe. Sucuri is the leading name in software security, and their security plugin for WordPress is among the most popular. Find out if Sucuri is right for your website in our Sucuri review. While WordPress is a secure CMS, security is relative — and it often depends on the actions (or inaction) of users. WordPress is one of the most popular CMSes, now running over 31% of all sites on the web. Unfortunately, that also makes it popular among hackers. Every day, tens of thousands of websites are hacked. Their goal is to steal sensitive data, hijack your server or email to send spam or commit fraud, spread malware to your visitors, and other malicious activities. Most WordPress users aren’t security experts, and aren’t aware of the best ways to keep their sites safe. But using a security plugin like Sucuri can automate and guide you through the processes you should follow to fight back against hackers. Sucuri Inc is the top website security company in the world. It’s famous as a security suite that provides security software and services for your website. Sucuri offers a powerful WordPress plugin that you can install to protect your website from malware and hacks. It creates multiple layers to safeguard your website from security threats. Sucuri has a cloudproxy firewall that bypasses all your traffic before sending it to the hosting server. It blocks any malware attack or hacker’s attempt to put your website at risk and you’ll get only real visitors. It also makes your website faster in speed and performance. Sucuri is a great addition to your must-have WordPress plugins list. Sucuri also offers a WordPress security plugin that will help prevent your website from being hacked. It offers tools to continuously monitor and scan your site and plug any security leaks and loopholes. Security Activity Auditing: Logs all security-related activity on your site, including logins, failed login attempts, etc. File Integrity Monitoring: Automatically detects any changes to your files. Remote Malware Scanning: Uses Sucuri’s scanner, SiteCheck, to search your site for malware. Blacklist Monitoring: Checks with blacklist engines to make sure your site isn’t being blocked for security issues. Effective Security Hardening: Security hardening removes vulnerabilities, such as removing your WordPress version display and protecting your uploads directory. Post-Hack Security Actions: A checklist of actions you should take in case your site is compromised. Security Notifications: Customize how and how often you’re notified of all the above activities. After installing and activating the Sucuri plugin, you’ll see a notification that you need to generate a free API key to fully activate all its features. Click the Generate API Key button and follow the instructions in the popup. That’s it! The plugin will be automatically configured for you. You can now navigate to Sucuri Security » Settings to customize the options if you would like to. You’ll probably want to review the notification settings under the Settings » Alerts tabs. To scan your site for malware, just go to Sucuri Security » Malware Scan and click the Scan Website button. You can click across the tabs to view the details of your results. If you click on Sucuri Security » Hardening, you’ll see a list of options for improving your website’s security. Many are enabled by default, but you can scroll through them to see if there are any others you’d like to enable. Under Sucuri Security » Post-Hack is a walkthrough that guides you through the steps you should take if your website is hacked. You can also review the latest user logins under Sucuri Security » Last Logins. The Pro version includes Sucuri’s Website Firewall, which is a reverse proxy that filters all your traffic through one of various Points of Presence (POPs) around the world. By installing the firewall, you’ll allow Sucuri to see all incoming traffic and proactively defend your website from DDoS, brute force, and other attacks. You’ll also get more in-depth reporting on the state of your site and security actions. Sucuri maintains a huge knowledgebase on their website with all the information and tutorials you’ll need to keep your site secure with their plugins. They also have a blog where they post security tips. For the free version of the plugin, you can post in the WordPress.org support forums for help. The developers are active there and most threads are responded to and resolved quickly. The Pro version of the plugin includes customer support from the developers via support tickets, and there’s even a Business plan that includes live chat support. If you’re looking for the most comprehensive security plugin for WordPress, Sucuri is what you need. While iThemes Security and Sucuri both have many of the same features to secure your WordPress site, Sucuri goes beyond iThemes Security with their DNS level firewall. If your site suffers slow loading speeds due to DDoS attacks, brute force attacks, spam, or other attacks, then you really need to address security at the hosting server level. You can read more details about this in WPBeginner’s post “How Sucuri Helped us Block 450,000 WordPress Attacks in 3 Months”. However, if you don’t have the budget for a premium security plugin, then you might prefer iThemes Security, which has a somewhat more beginner-friendly user interface. Check out our iThemes Security review for more details. Another popular option for WordPress security is WordFence. We believe WordFence isn’t the best option, though. You can read why in our WordFence Security review. 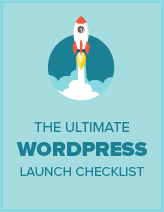 You should also read out the ultimate WordPress security guide for more details. Should You Purchase Sucuri to Protect Your WordPress Website? We discussed the features, functionality, and flexibility that Sucuri offers to its users. Sucuri’s security suite provides the best security to safeguard your website from malware and hacks. Let’s take a look at the 3 key factors that’ll make you purchase Sucuri right away. Sucuri is known for being the most comprehensive and powerful security solution to protect your website from threats. Not only does it protect you, it takes precautionary measures to prevent your website from succumbing to harm and blocks all attacks at the server level before you even know about them. One of the common examples was the Elegant Themes vulnerability issue. Sucuri protected hundreds of thousands of websites by patching their servers long before users updated their themes and plugins. Sucuri has a tracking functionality that keeps logs for every activity. That means you can always find out what’s happening with your website and easily fix issues. Sucuri hardens the WordPress security with their 1-click hardening feature. You can also use the WordPress Audit plugin to check on your website’s activities. Sucuri provides server-level scanning and protects your WordPress website servers from attacks. On top of that, they monitor new and potential security threats. They inform these security issues to WordPress’ core team and work side-by-side to patch the servers. Sucuri’s team is also connected with third-party themes and plugins to update them about the attacks and hacks. They patch the vulnerabilities at firewall-level and keep your website protected from all security concerns. Sucuri has 24/7 customer support which means you’ll always find their team available. They also offer an instant chat feature to their premium users. Sucuri engineers are always up-to-date with the new developments and keep their customers informed about security threats. You can easily rely on their support team to help you protect your website against attacks. Now that we discussed the reasons to purchase Sucuri, let’s take a look on their pricing plans. 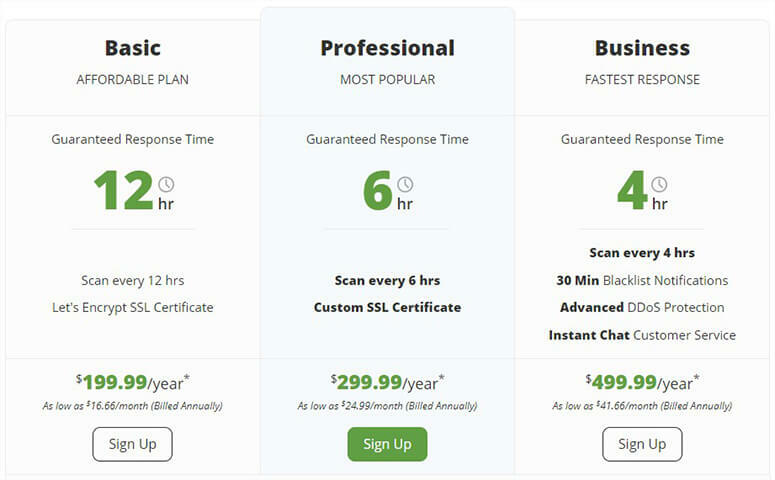 Sucuri offers 3 pricing plans for personal to business websites. All these plans have different pricing and features. The 3 plans are divided into Basic, Professional, and Business categories. Their Basic plan is affordable and it scans your website every 12 hours for the security check. It comes with a Let’s Encrypt SSL certificate, and costs $199.99 per year. The Professional plan has fewer intervals for scanning your website. It scans every 6 hours to protect your WordPress website from security threats. Other than that, it comes with a custom SSL certificate, and costs $299.99 per year. Sucuri’s most advanced and powerful plan is their Business plan. It has the fastest response on security threats and attacks. If you purchase this plan, it comes with instant chat support with Sucuri team, blacklist notifications, advanced DDoS protection, and much more. This plan costs $499.99 per year. However, all 3 plans include unlimited malware cleanup, website firewall (WAF), attack prevention capability, blacklist removal, and protection from hacks. Sucuri is a great option for keeping your WordPress website safe and secure from all kinds of attacks, especially if you have the budget for the pro version. No other security plugin offers a DNS-level firewall. Sucuri are total garbage pricing model is made to nickel and dime. Support never hets you in 24 hours or less. And I have yet to get my refind from the time I cancelled week 2 in the trail period. Thieves and liars. Sucuri has bad customer service with zero tolerance. I used their professional service for a year without much issue but few days after I renewed for another year, their script complicated my website. They finally abruptly removed my website and closed my account with them without proper communication. Same here. Sucuri is awful. Go with MalCare. They’re cheaper, and if their software fails to handle something, they take care of it. Plus they allow license switching up to once every 3 months. I agree, I paid top dollars for their service but I’ve been hacked again and pretty badly despite following their advices. No 24/7 support either. Look elsewhere, forget about Sucuri. I wish I knew better. Sucuri is absolute rubbish. Avoid at all costs. Expect astonishingly terrible customer service, or lack thereof. Put in a ticket because there are no live humans to help you. Owned by GoDaddy now so that about explains it. Once you submit a ticket, expect to wait an eternity for a reply. Then when you reply to their reply, expect to wait another eternity. Their Web application firewall also. Blocked my Adsense so wound up costing me about 60 dollars so far in lost advertising revenue. My contempt for this company knows no boundaries. Steer clear. You’ll regret it if you don’t.